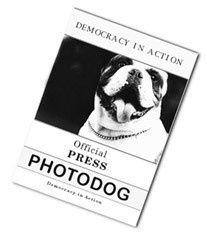 Copyright © 2007, 2008 Eric M. Appleman/Democracy in Action. Dec. 16, 2007-Former Gov. Mitt Romney (R-MA) after an appearance on NBC News' "Meet the Press." Nov. 30, 2007-DNC Fall Meeting in Vienna, VA.
Nov. 25, 2007-Sen. John McCain (R-AZ) after an appearance on ABC News' "This Week." Nov. 7, 2007-Rev. Pat Robertson endorses former New York City Mayor Rudy Giuliani (R). Nov. 2, 2007-Sen. Kit Bond (R-MO) endorses former New York City Mayor Rudy Giuliani (R). Oct. 19-21, 2007-FRC Action's Washington Briefing 2007: Values Voter Summit. Oct. 16, 2007-Sen. Hillary Rodham Clinton (D-NY) at Women Changing America campaign event. Oct. 5, 2007-Americans for Prosperity Foundation's "Defending the American Dream Summit." Oct. 3, 2007-Sen. Hillary Rodham Clinton (D-NY) receives the endorsement of the American Federation of Teachers. Oct. 1, 2007-Beyond the Beltway-New Hampshire Secretary of State Bill Gardner is Defender of the New Hampshire Primary. Sept. 24, 2007-Sen. Evan Bayh (D-IN) endorses Sen. Hillary Rodham Clinton (D-NY). Sept. 21, 2007-NRA Celebration of Values Conference. Sept. 17, 2007-SEIU Member Political Action Conference. Sept. 12, 2007-Sen. Hillary Rodham Clinton (D-NY) receives the endorsement of the National Association of Letter Carriers. Sept. 4, 2007-Sen. Hillary Rodham Clinton (D-NY) addresses the Alliance for Retired Americans. July 31, 2007-Senators Klobuchar, Alexander and Lieberman announce the Regional Presidential Primary and Caucus Act. July 30, 2007-Former Sen. Fred Thompson (R-TN) arrives at a fundraiser. July 14, 2007-Ralph Nader addresses a rally at the West End Library. July 10, 2007-New York City Mayor Michael Bloomberg at a Mayors Against Illegal Guns press conference on Capitol Hill. July 6, 2007-Rep. Ron Paul (R-TX) after taping an appearance on ABC News' "This Week." June 30, 2007-DNC Rules and Bylaws Committee meets to consider delegate selection plans. June 18-20, 2007-Campaign for America's Future's "Take Back America" Conference. June 19, 2007-AFSCME Democratic Presidential Forum. June 12, 2007-Sen. Hillary Rodham Clinton (D-NY) receives the endorsement of Sen. Bob Menendez (D-NJ). June 2, 2007-Beyond the Beltway-New Hampshire Democratic Party Convention in Concord, NH. May 29, 2007-Former Vice President Al Gore promotes his new book The Assault on Reason. May 27, 2007-Gov. Bill Richardson (D-NM) after his appearance on NBC News' "Meet the Press." May 24, 2007-Rep. Ron Paul (R-TX) presents "Reading for Rudy." May 23, 2007-Sen. Barack Obama (D-IL) at "Generation BO" kick-off event. May 17, 2007-Sen. Joe Biden (D-DE), Rep. Dennis Kucinich (D-OH) and Sen. Hillary Rodham Clinton (D-NY) address "Enough is Enough" rally. May 17, 2007-Gov. Bill Richardson (D-NM) speech on energy at New America Foundation forum. May 16, 2007-Sen. Hillary Rodham Clinton (D-NY) receives the endorsement of Congresswoman Doris Matsui (D-CA) during the launch of Asian Americans and Pacific Islanders (AAPI) for Hillary. May 16, 2007-Former Sen. John Edwards (D-NC) addresses the International Association of Machinists and Aerospace Workers (IAM). May 14, 2007-Former Alaska Sen. Mike Gravel (D) announces a plan "guaranteed to end the war in Iraq." May 7, 2007-Former New York City Mayor Rudy Giuliani (R) addresses a Heritage Foundation dinner. April 27, 2007-Sen. Hillary Rodham Clinton (D-NY) addresses NYSUT convention. April 25, 2007-Actor Sam Waterston makes the case for Unity08. April 14, 2007-Beyond the Beltway-Speeches at the Republican Party of Iowa's Abraham Lincoln Unity Dinner in Des Moines, IA. April 9, 2007-Former Speaker Newt Gingrich (R) speech to Young America's Foundation and GW College Republicans. April 1, 2007-Former Gov. Tommy Thompson (R-WI) after an appearance on ABC News' "This Week." March 31, 2007-One of the thousands of "Hope, Action, Change" community meetings organized by Obama campaign supporters. March 28, 2007-Seven Democratic candidates address Building and Construction Trades Department's presidential forum. March 28, 2007-Gov. Bill Richardson (D-NM) speaks on preventing nuclear terrorism at SAIS. March 22, 2007-Former New York City Mayor Rudy Giuliani (R) addresses the National Newspaper Association and receives the endorsement of former Maryland Gov. Bob Ehrlich. March 20, 2007-Sen. Hillary Rodham Clinton (D-NY) and former President Bill Clinton do a fundraiser. March 20, 2007-Rep. Ron Paul (R-TX) signs the Freedom Pledge at American Freedom Agenda event. March 14, 2007-Eleven presidential prospects at IAFF Bipartisan 2008 Presidential Forum. March 13, 2007-Sens. Hillary Rodham Clinton (D-NY), Chris Dodd (D-CT) and Joe Biden (D-DE) speak at the National League of Cities meeting. March 12, 2007-Sen. David Vitter (R-LA) endorses former New York City Mayor Rudy Giuliani (R). March 7, 2007-South Carolina Democratic Party's "Countdown to the South Carolina 2008 Primary." March 6, 2007-Sen. Hillary Rodham Clinton (D-NY) addresses EMILY's List "Women in Power" luncheon. March 1-3, 2007-34th Conservative Political Action Conference. Feb. 27, 2007-Gov. Bill Richardson (D-NM) speaks at the Latino Leaders Network luncheon. Feb. 25, 2007-Gov. Bill Richardson (D-NM) addresses AFGE Legislative Conference. Feb. 25, 2007-Former Sen. John Edwards (D-NC) after an appearance on CBS News' "Face the Nation." Feb. 6, 2007-Congressmen announce their support for former Gov. Mitt Romney (R-MA). Feb. 1-3, 2007-DNC Winter Meeting. Jan. 28, 2007-Former Gov. Mike Huckabee (R-AR) speaks at the National Review Institute's Conservative Summit. Jan. 27, 2007-Former Gov. Mitt Romney (R-MA) speaks at the National Review Institute's Conservative Summit. Jan. 26, 2007-Former Gov. George Pataki (R-NY) proposes "A Way Forward in Iraq" in a speech at Georgetown University. Jan. 24-25, 2007-Sens. Chuck Hagel (R-NE), Joe Biden (D-DE), Hillary Rodham Clinton (D-NY) and others address The United States Conference of Mayors 75th Winter Meeting. Jan. 24, 2007-Rep. Dennis Kucinich (D-OH) calls for uinversal healthcare. Jan. 22, 2007-Sen. Sam Brownback (R-KS) and Rep. Duncan Hunter (R-CA) appear at several pro-life events held in conjunction with the March for Life. Jan. 21, 2007-Sen. Sam Brownback (R-KS) after an appearance on ABC News' "This Week." Jan. 20, 2007-Beyond the Beltway-Sen. Sam Brownback (R-KS) formally announces his candidacy in Topeka, KS. Jan. 19-20, 2007-RNC Winter Meeting. Jan. 16, 2007-Rep. Dennis Kucinich (D-OH) speaks at appeal for redress event organized by groups against the war in Iraq. Jan. 14, 2007-Sens. Chris Dodd (D-CT) and Chuck Hagel (R-NE) after an appearance on NBC News' "Meet the Press." Jan. 8, 2007-Sen. Chris Dodd (D-CT) discusses his legislation to establish voluntary national standards for math and science. Jan. 7, 2007-Sen. Joe Biden (D-DE) after an appearance on NBC News' "Meet the Press."